The official list of public holidays in the Philippines for year 2014 was released and signed by President Benigno Aquino III. 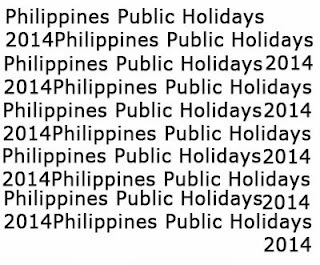 The declared 18 official public holidays in the Philippines for 2014 are listed below. According to Proclamation No. 655, the declared public holidays includes the Chinese New Year on January 31 (Friday), Decembers 24 (Wednesday), and December 26 (Friday). Eid’l Fitr and Eidul Adha proclamations will be issued. For the meantime, please bookmark this page now or visit this site more often for you to be updated. You may also share this post to your friends so they may know about Philippines Public Holidays 2014. Comments or suggestions about "Philippines Public Holidays 2014 Officially Released" is important to us, you may share it by using the comment box below.